Proper wheel alignment helps you save money by reducing tire wear, improving fuel economy and handling, while also increasing the responsiveness of your vehicle. You should have your vehicle’s alignment checked once a year or every 12,000 miles to 15,000 miles. Normal wear and road conditions can take their toll on your vehicle’s steering and suspension system, possibly throwing the alignment settings out of specifications. At Midas, our trained and certified technicians perform alignments using cutting edge laser guided machines. No more smoke and mirrors! A proper wheel balance ensures that the wheels, while spinning, do not have a heavy spot that can cause vibrations and premature wear of the tires, struts, shocks, and other steering and suspension components. The most common signs of unbalanced tires are vibrations and noise. These vibrations can affect the speed, handling and mileage of your car. A good rule of thumb is to have your wheels balanced with every tire rotations or at least once a year. It’s also not uncommon for the actual wheel weight to fall off the rim, causing a wheel to be unbalanced, so a routine visual inspection, with every oil change, is recommend as well. 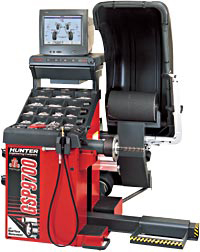 At Midas we perform wheel balances using the most accurate and precise balancing machines available. Any time you purchase new tires or rims it is highly recommended to perform a wheel balance in conjunction with a wheel alignment.